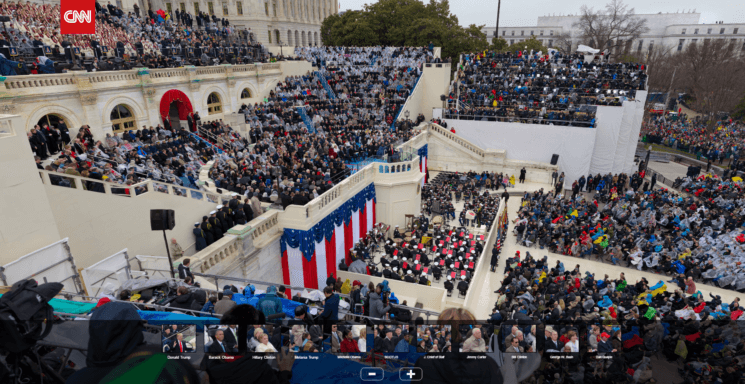 Can you find your friends in a gigapixel photo of Trump’s inauguration? If you wonder who was at Donald Trump’s recent inauguration, here’s something to satisfy your curiosity. CNN takes you there with a single image, as they have published a gigapixel photo of the event. Since gigapixel technology has taken off in the past couple of years, it was probably expected. So, now you can finally see it and check out every detail of the event. Here is the interesting thing though, the 5D mark II was announced on Sep, 2008, it’s actually a year newer than the 1Ds Mk III that was used to photograph president Trump. On March 4th, 1857, while the Capitol building was still under construction, James Buchanan was sworn in as the 15th President of the United States of America. The 1850s were a significant period in photography. The wet collodion process was invented in 1851. It gave photographers the ability to make direct contact prints from glass negatives. You needed to take a whole darkroom around with you to do it, though. Long exposures were still often necessary, as one would typically work with ISO rating of 6 or less. But it finally allowed photographers to document many things for the first time. Including the presidential inauguration of James Buchanan. Created by John Wood, working for the Montgomery C. Meigs at the Architect of the Capitol. The perceived devil horns grabbed the headlines, but the real story behind the deep symbolism embedded within Time Magazine’s 2016 person of the year cover featuring Donald Trump is much more interesting. Nadav Kander is a brilliant photographer and the impression of Donald Trump that you get from his photograph is unmistakable – following in a long tradition of using photography to influence perception – like Arnold Newman’s evil brooding image of Nazi industrialist Alfred Krupp, to Platon’s cold, inhuman portrayal of Vladimir Putin. Kander’s treatment of Trump is subtle enough that supporters probably don’t see past a tough looking businessman, but the deliberate nuance to this image is delicious – so lets take a moment talk about this image of Donald Trump from a photography perspective. Each year, the editors of Time magazine choose the person of the year – the one who has most influenced the news and the world over the past year. But this year, their cover page reading “Donald Trump: President of the Divided States of America” caused a major stir on social networks. And all because of one letter making Trump looks devilish. Donald Trump is many thing, but gentle-tempered is probably not one of them. On his Wednesday speech in a South Carolina ballroom AP photographer Mic Smith took a photo of the ballroom looking half empty with all the back chairs being unoccupied. That photo was used by news outlets like the NYTimes and businessinsider to suggest that Trump is losing traction.